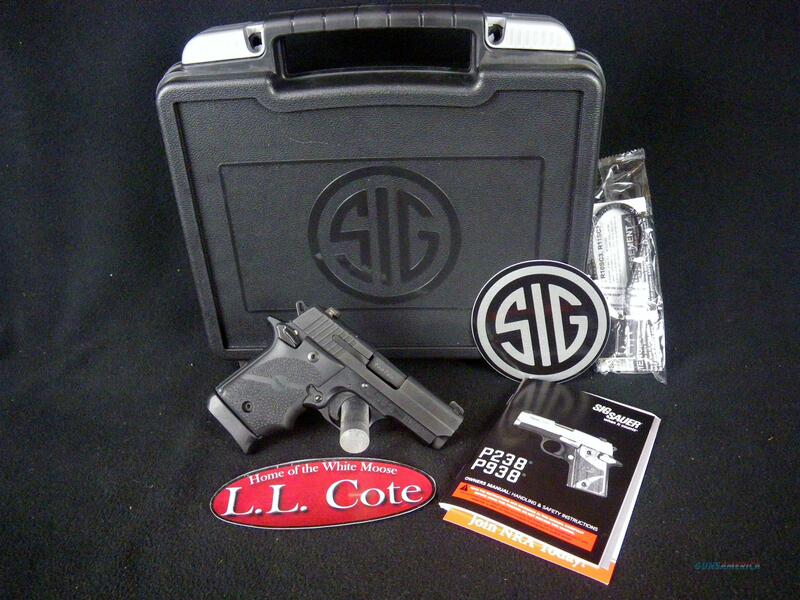 Description: You are bidding on a Sig Sauer P938 BRG Micro-Compact in 9mm with a 3" barrel. The P938 BRG finish with black Hogue rubber grips offers the ballistic advantage of the 9mm cartridge in a platform similar in size to the best-selling P238 pistol. The stainless steel slide features the popular trademarked SIG SAUER slide serrations, corrosion resistant edge finish and SIGLITE Night Sights. A single-action-only trigger, coupled with full-size SIGLITE Night Sights makes the P938 handle like a much larger pistol, yet is still easy to carry concealed. With dimensions just slightly larger than its .380ACP counterpart, the P938 packs seven plus one rounds of 9mm into an all-metal frame. The single-action trigger gives the P938 unmatched accuracy in a pistol its size. Fans of the 1911 will find the thumb safety, magazine release and slide stop lever in familiar places. An ambidextrous safety makes the P938 easy for left- and right-handed shooters. Displayed images are stock photos. Any questions please feel free to ask (our phone number is in the additional information tab above).